Chris Smith is in debt. He owes money to the wrong sort of people - the unforgiving, impatient sort. Desperate times inspire desperate measures and he comes up with a diabolical plan. If he hires, Killer Joe (Matthew McConaughey) to murder his mother, he can persuade his sister Dottie (a superb Juno Temple) to share her inheritance with him. Add a deadbeat father and horrendous stepmother into the mix and you just know what you have the recipe for - and it isn’t good. Want To Know What Films To Watch And What To Avoid? Click Here And Join The Club! Killer Joe is a horrible film that I enjoyed only for the powerful performances given by the five central characters. However, everything else about this film is pure sleaze and grime. Don’t get me wrong, things are deliberately that way. We are not meant to like any of these characters (with the exception perhaps of Dottie) and we are not meant to enjoy this story. There are just parts of Killer Joe that I found objectionable and without merit. It is not that I am afraid of watching a film with violence (of which this film has plenty) or that I take against a movie with tough scenes and themes.You’d be hard pressed to find a film with tougher scenes than Tyrannosaur, for example, and I really admired that film. There just wasn’t anything to admire in this film apart from the acting and even that didn’t feel enough. In the end, this film wasn’t for me and that is okay. Killer Joe is an interesting film as it marked a significant departure for Matthew McConaughey. It became one of a series of complex and challenging roles that he selected in an attempt to move on from the rom com. 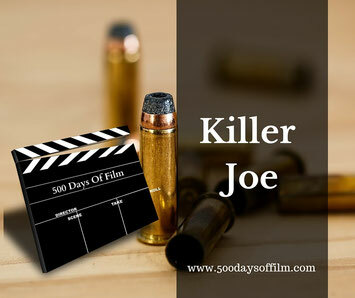 Have you seen Killer Joe? Do you agree with me? Whatever your opinion, I’d love to know in the comments section below!